Quite a few gun owners had their first introduction to shooting with a BB-Gun, perhaps after finding a “Red Ryder” under the Xmas tree (the rifle featured in the movie “A Christmas Story”). Now you can let your kids or grand-kids experience the same thing. Orvis is offering a special Red Ryder Commemorative Edition, for shooters who remain young at heart. This classic Red Ryder BB gun — the very same model immortalized in “A Christmas Story” — comes with a 560-count tin of BBs. 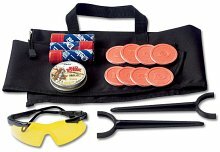 You also get eight clay targets, two target stands, and even eye protection. For other neat last-minute gifts from Orvis, click the link below and then select “Top-Rated Gifts” or “New for Holiday 2007″. There are lots of great items. We loved the Orvis FatWood, and the antiqued “Toasting Box”. Share the post "Commemorative Red Ryder"
Folks in the Forum have been asking “who makes a secure, high-capacity box for PPC and BR-sized cases?” For 50-rounders you have many choices. The MTM RS-S-50 is available in clear blue, green, and “wild camo”. Lock, Stock, and Barrel sells the RS-S-50 for just $2.79. 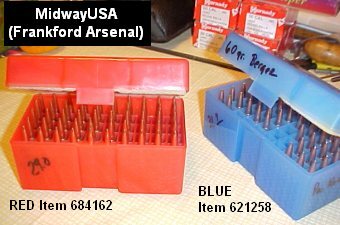 MidwayUSA sells a similar Frankford Arsenal case for $3.39 in clear blue, red, or smoke. It’s a nice design with a recessed latch that’s less likely to catch on something and pop open. For a big match or extended varmint expedition, 100-count boxes are the way to go. You can fill them to capacity, alternate rows for sighters and record rounds, or leave open rows for your fired cases. 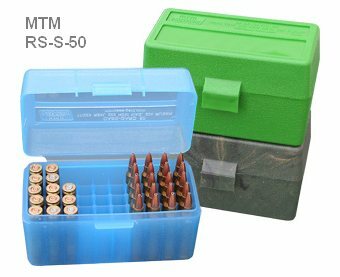 We like the MTM 100-round ammo boxes for transporting loaded 6BR and 6PPC ammo. They work great for loaded rounds. However, with fired brass, if you tip the MTM box on its side, the empties can spill out. That’s frustrating if you’ve meticulously sorted your cases. The answer to this problem is J & J’s 100-round BR-100 ammo case. Shown in the photo, it has tighter vertical clearance, so your empties won’t come out of their slots if the case tips over or is stacked upside down. 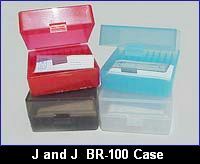 BR-100 cases are bargain-priced at just $3.95, and they are available in Red, Blue, Smoke, or White colors. In addition to the BR-100 case, varminters who need to carry large numbers of loaded rounds should check out J & J’s 175-round Rifle Ammo Case. This foam-lined ammo transporter, item LR-175, costs $16.54 and is the largest-capacity ammo case we’ve found. For more info go to JandJProducts.Com. Share the post "Storage Boxes for BR-Sized Cases"